Lots of activity in my world. Not necessarily in an art related way…but activity! And mostly good as well. We had Martha and Phil Mollison Cooper visit for a few days the first part of the month and enjoyed their stay as we always do. We went to the Whitman Mission site one afternoon and I renewed my interest, from an artist’s perspective, that area, as I stood out on the site of the mission next to the damn that was originally built by the Whitman’s. The wild rye grass must be at least 3 feet tall and imagined what that would have been like in the mid 1800’s – untouched terrain and that tall grass everywhere. A couple of new paintings did get completed and I am working on a larger piece now. I am also revising my syllabus for the pastel workshop. 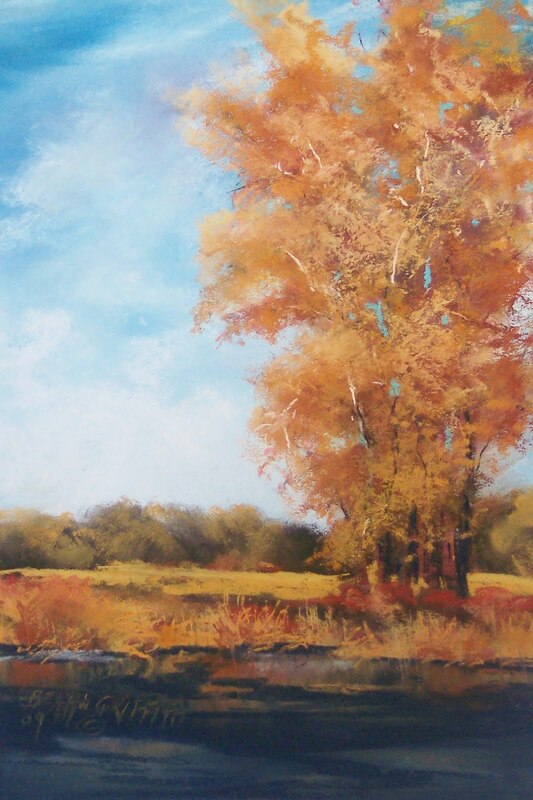 The workshop will be Oct 24-5 at Allied Arts of Richland. I am hopeful for a good turnout of students – 4 is the minimum and 12 is the max for the class due to space restrictions. The class will cover various papers and the use of different techniques that I use for pastel paintings. There are a ton of different ways to accomplish something and painting is not an exception! So if you know anyone interested in the workshop, contact the Allied Arts Center in Richland http://www.alliedartsrichland.org/. they have the form and supply list for the class. Community Bank corp recently purchased 3 different images that we printed for 5 of their banks! thank you Keith and Leah! Summer is coming to a close with the Labor Day weekend – so they say. I think I will still wear my white flip flops and capris though and conform to the “after Labor Day you don’t wear white” rule. It shouldn’t matter, I believe. Friends Martha and Phil were here last weekend as they set out on their “FunnyMoon” through the Palouse, up WA 95 enroute to Banf and Jasper and back to Victoria/Vancouver and other points. what a great pair of friends and joy to hang around with. Martha brought a travel diary from a 1971 car trip that she and I did, camping across America. I produced a couple of photos to substantiate her tales! We bought gas for about $3-4 a day, camping fees about $1-2/night and milk somewhere was 61 cents. As she and Phil drove away on their camping trip Monday morning, they will expect to put about $75 in their gas tank once it nears empty. My good friend Margaret (http://magpies2.blogspot.com) has moved to Germany for a year. She is amazing in the arts and life and I wish her a wonderful year abroad. My hopes are to sneak over and visit sometime before she returns to the US. Beginning to work on new works for some upcoming shows. Les and Justin are leaving Friday for Montana to take some pieces to Moccasin Mtn Gallery and maybe buzz on over to Miles City to see Chris, Michelle and “No” Sam. I am working on paintings for the Nicholas Cole gallery/winery in Walla Walla for winter barrel tasting and some miniatures for a show in MT in November. Just watched a netflix documentary “the Hobart Shakespearians“. It is a great story of someone who goes beyond the scope of his job and the difference it has made for his students in an inner city LA middle school. Well worth the time to watch it.